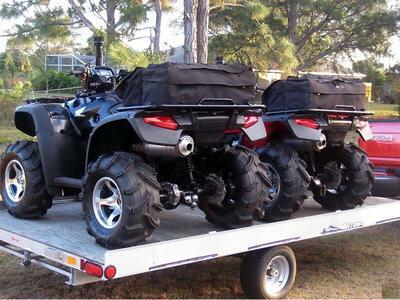 I have (2) 2006 Honda Rincon ATVs for Sale with Trailer! 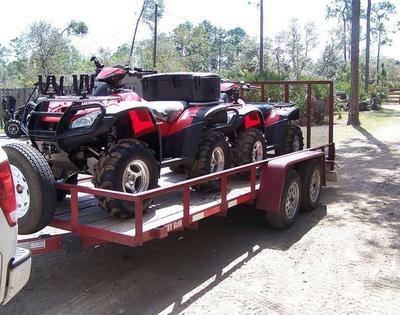 Here's a chance to buy matching "HIS and HERS" ATVs! The HIS ATV is a 2006 Honda Rincon that has a Warn winch,ITP tires and wheels, 2 inch lift kit complete skid plate and rock guards and a front warn bumper/brush guard. 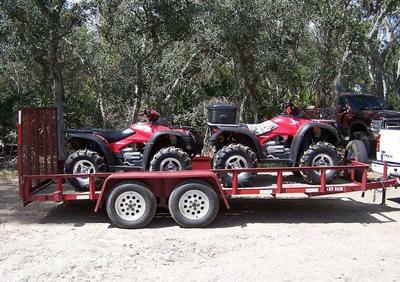 The HERS ATV is (also)A 2006 Honda Rincon Loaded with warn winch,ITP tires and wheels complete skid plate and rock gaurds and a front warn Bumper /brush guard. And then there is a trailer to haul them both on which is a 16 foot 2006 Anderson tandem axle trailer painted to match with aluminum wheels and electric brakes. Also included are miscellaneous spare parts such as oil filters, oil, cv boots, misc o-rings etc. Both of the Rincons have been perfectly maintained (only Amsoil synthetic lubricants have been used) and all items and systems operate as designed. They had their annual service performed, have been adult driven and never wrecked or used under water. If you have any questions regarding either of the used Honda ATVs for sale or the trailer or if you would like to make an appointment to see the setup in person you can do so using the space below that has been provided by GoGoCycles Used Honda ATVs for Sale and PLEASE do not neglect to include your contact information in your email or to provide a phone number or email address so that I can respond with answers to your questions or set up an appointment as quickly as possible. 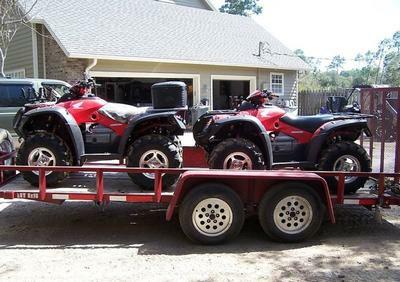 In my opinion there is not a better deal on two Honda ATVs and a trailer for sale like this one in Atlanta Georgia GA, on Craigslist or in an Ebay auction so hurry and make an offer before this package deal gets away from you! GoGoCycles would also encourage our biker friends to write a review of the (2) 2006 Honda Rincon ATVs for Sale with Trailer or share any thoughts and/or opinions to make potential buyers aware of any problems that are commonly associated with these four wheelers or to highlight their positive features and help our visitors make informed decisions. I'm leaving this ad up to ALERT potential buyers to problems with this seller..please read the comments section for details. My asking price for the complete set up is very reasonable so email before it's gone and don't forget to mention that you found this ad on GoGoCycles Motorcycle Classifieds www.gogocycles.com using the comments forms located on this page. This is also on Tampa FL Craigslist. Scammers Everywhere! The same ATV's are being sold on Denver Craigslist for $2500 by Sgt. Deborah Dumont. BEWARE!!!!! Found the 2 rincons and trailer to be a scam. Agreed to the offer and when trying to make arrangements for purchase, seller wanted money first and would deliver later. When asked buyer for location, seller said they were in Birmingham Al. Agreed to meet there and pay cash for items and email traffic stopped at that point. Unable to make contact anymore. I'm leaving this ad up to ALERT potential buyers to possible problems...please read the comments. same pics with same four Wheeler same house same cars in back round being sold as 2005 and 2006. police are already involved. i have an invoice wanting me to take CASH to a western union and send to An agent. feel sorry for who is the real owner of these. they will now only be able to sell Local. NOTE FROM POLICE. IF YOU CANT GO LOOK AT AND SEE TITLE OR WHAT HE CALLED CERTIFICATE OF ORIGIN DONT BUY. Also note !!! there is no such thing as a buyer protection program unless you purchase from an official online RETAIL store. SCAM SCAM SCAM you worked hard for your money.. dont let them rip you off.. Since these same pictures are posted on a site in LA for sale by someone totally different with no contact info, I would have to be a little wary. On what do you base your opinion? Were you the victim? Someone you knew?